Santa, your reindeer taste so good! 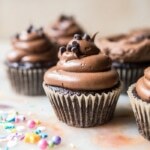 In the form of a super moist, super chocolatey cupcake. 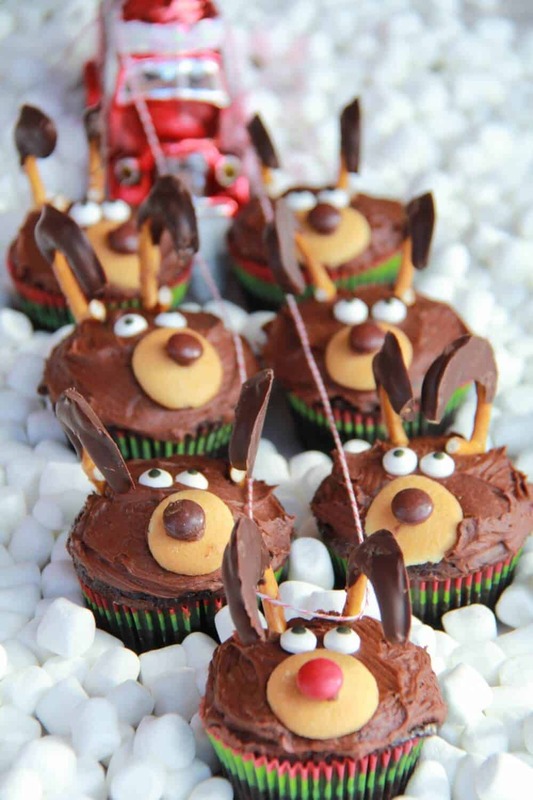 Of course, Rudolph and his friends are covered in whipped chocolate frosting that tastes almost mousse like and then decorated with chocolate covered pretzels, mini Nilla Wafers and M&Ms. Seriously, I never knew Reindeer could taste so good! Honestly though these are the cutest cupcakes. They are so fun and so good and so simple! They are perfect for any of your upcoming Christmas parties and trust me people with go crazy for them. Like out of their mind, do anything for these cupcakes. I was taking pictures and taking forever because I am not a photographer and taking pretty pictures is harder than you may think! Anyway, I was taking way too long because I had some very hungry people chomping at the bit for one of these guys! Someone had a bit of a meltdown because she could not wait any longer to bite Rudolph’s nose off……Asher. The whole time I was taking pictures of these cute little guys I had some nice background music of “Tiegy I am hungry, my tummy is hungry for those cupcakes, I want Rudolph”. They are almost too cute to eat……..almost. For the cupcakes: Heat oven to 350°F. 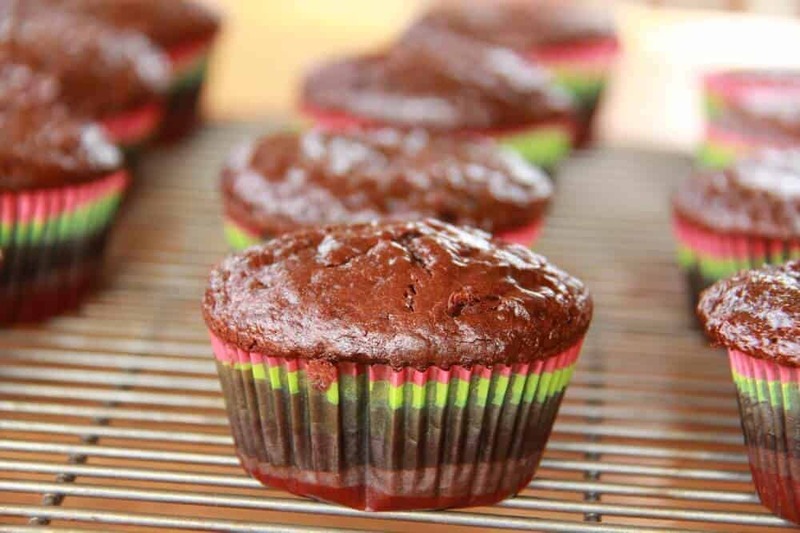 Line muffin cups with cupcake liners. Stir together sugar, flour, cocoa, baking powder, baking soda and salt in large bowl. Add eggs, buttermilk, oil and vanilla; beat on medium speed of mixer 2 minutes. Stir in the boiling coffee (batter will be thin). Fill cups 2/3 full with batter. Bake 22 to 25 minutes. Cool completely. Frost. For the frosting: Beat butter on medium speed for two minutes. Add the powdered sugar and whip until combined. Add the cocoa powder and whip until fully incorporated. Mix in the vanilla and milk. Add more milk if the frosting looks too dark. You want the color to be light brown like milk chocolate mousse. Whip for one last minute. Frost the cupcakes. To assemble: Line a baking sheet with wax paper. Carefully break pretzels into large antlers (I over-broke several pretzels before I got it just right, so you may want to be prepared with extra pretzels). Dip the tops of the antlers in the melted chocolate and place on the baking sheet and place in the fridge to harden. Generously frost the cupcake with chocolate frosting. Place the mini vanilla wafer near the bottom center of the cupcake. Place a small amount of the frosting onto the back of the red or brown M&M and attach it to the top center of the vanilla wafer. 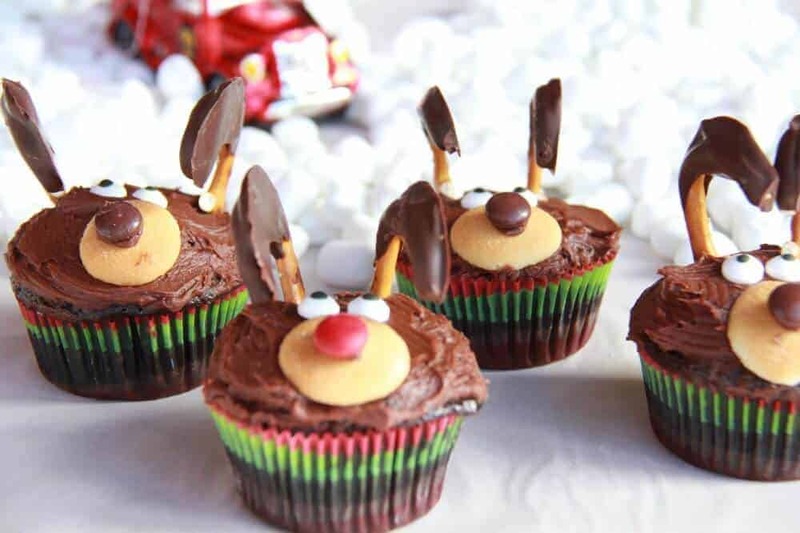 Once the chocolate has hardened to the antlers remove them from the fridge and attach the pretzels at the top of the cupcake, pointing diagonally outward or inward (whatever you prefer). After the pretzel antlers are arranged, add the M&M or candy eyes into place (for me it was directly above the vanilla wafer snout). *To bring eggs to room temp, place them in a glass of hot water for 5 minutes. *To bring the buttermilk to room temp, place in the microwave for about 30 seconds. *The pretzel thins I used are the bite size pretzel twists, but either thins or regular twists can be used. Watch out Rudolph, she’s going in for the kill. 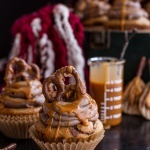 Death By Butterbeer Cupcakes w/Treacle Butter Frosting + Chocolate Covered Pretzels. 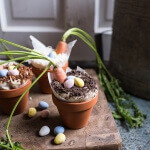 Double Chocolate Nutella Carrot Cake Cups with Malted Cream Cheese Frosting. Your cupcakes are adorable! My grandchildren would be all about helping to make these! THanks you! They are really fun and my little sister had a blast with them! These are adorable! Thanks for sharing. I’m visiting from Weekend Potluck. Thanks! They really are so much fun! So cute and they look like they were a lot of fun to make! They would be fun to take to a Christmas party! I’m visiting from Pin Me link party, and I’ll be pinning. Thanks for the fun idea! Thanks for pinning and yeah if you bring them to a Christmas party everybody will be in Aw! These are the cutest cupcakes I’ve ever seen. Great idea! Just pinned! Thanks fo pinning! They really are just so cute! Thanks so much! They are really fun! These are too darn cute! 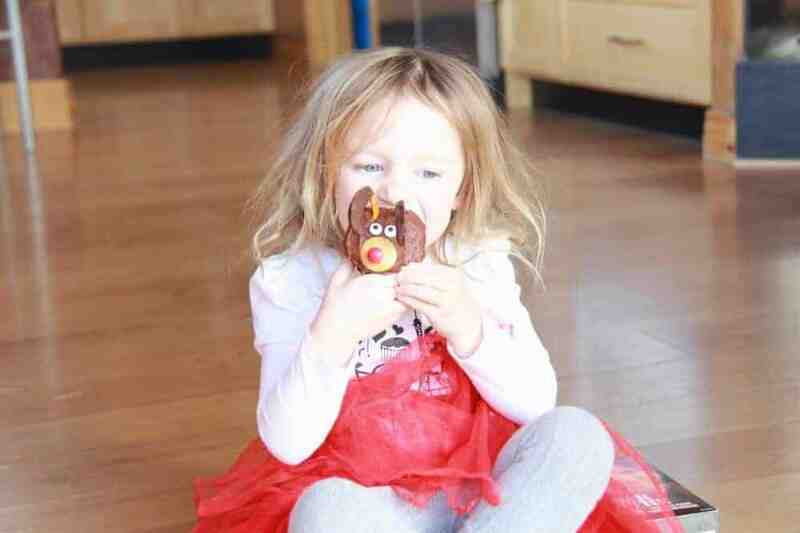 Look like your little one really enjoyed them! 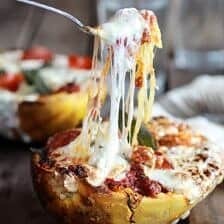 Thank you for linking up to Foodie Friends Friday! I can’t wait to see what you bring next week! Thank you and that is actually my 4 year old sister! But I get that all the time! Super super cute my little pastry chef will have fun making these. thanks for sharing them on foodie friday. My daughter is going to make them for Christmas day. They are the perfect Christmas day treat! Let me know what you guys think! So adorable!!! I love these! These would be so great for school parties! THanks! Kids do go CRAZY for them! So glad you like them! Thanks for featuring them! MY little sister went crazy for them! OMG, I LOVE this! And Love that you photographed these in mini marshmallows!!! Brilliant! Thanks for the invite and the amazing comments! These are just beyond cute adorable amazing! Love it and I’ll be making these. I hope mine turn out as cute! Let me know how your go! They are supper easy! Have fun with them! 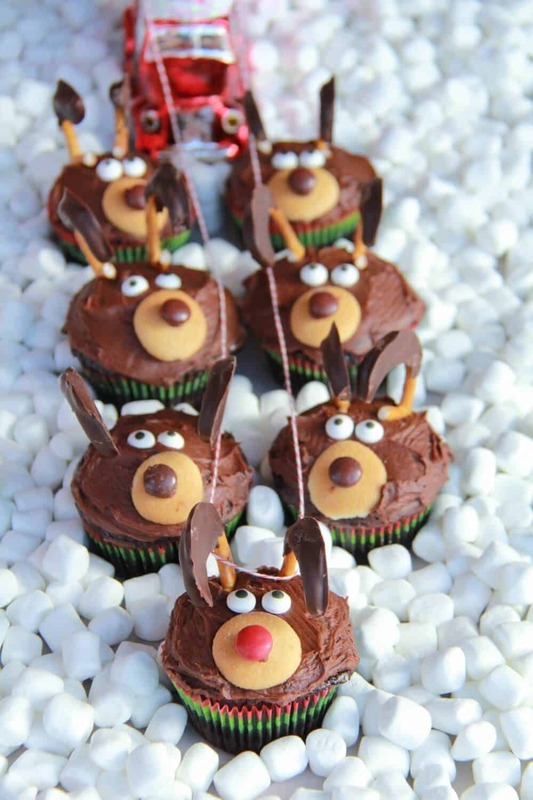 I agree…the cutest cupcakes of the season!!! I love that you photographed them in the “snow” too! I am pinning this one for sure!!! THanks for pinning and I just have to have snow! You can not do Reindeer without snow! So so CUTE! I need to make these with my boys – pinned 🙂 Thank you for sharing at All my Bloggy Friends! 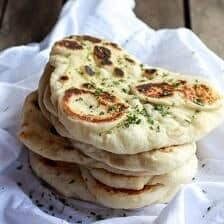 These are perfect to make with you kids! Let me know how they turn out! Yum! I love the marshmallow snow!! So cute! New follower! Thank you and thank you for following! 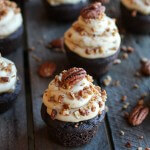 These cupcakes are so cute, I’m delighted with these awesome idea! I’ve featured this recipes on my blog! I hope you don’t mind! If you don’t agree with that please contact me and I will remove it. All the best. Thank you so much for the feature! I am honored! Could you send me the link? 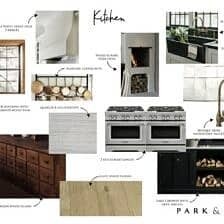 I would love to check it out along with your site! These are so cute, perfect for a class party! You had the perfect taste tester as well, adorable! 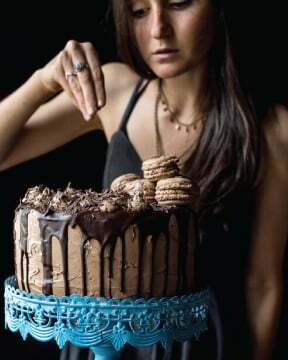 Thanks, and yes she is the PERFCT taste tester! SHe went crazy fro these! Those are sooo cute! they would be the hit of the party, for sure! So very cute! My little guys (and their friends) would love these! 🙂 You are a featured favorite this week on Saturday Show & Tell on Cheerios and Lattes! Thanks for sharing your great ideas with us each week; we love having you! Can’t wait to see what you’ve been up to this week! These look so adorable! Thanks for sharing at Foodie Friends Friday! Thank you, they are really and fun and really delicious! 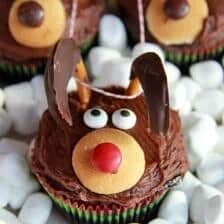 Your Chocolate Reindeer Cupcakes look adorable! Hope you are having a great week and thanks for sharing. These cupcakes are awesome! I love the way you set them up too, in marshmallows! Thank you, I have so say I had a lot a fun taking these photos! Oh my goodness! They are super cute, and the presentation with the sleigh is lovely! Thank you! It was really fun! These are such cute cupcakes. They look delicious! Thanks for sharing on Foodie Friends Friday! Please come back to vote on Sunday! We would appreciate if you would please put a link back to FFF somewhere on your post! Thank you! These guys are powerfully cute! Thanks for bringing them to Tuesday’s Table – hope you come back next week! These are SO adorable! I love them!!! These are the cutest cupcakes I’ve seen in a looooooooooooooong time. 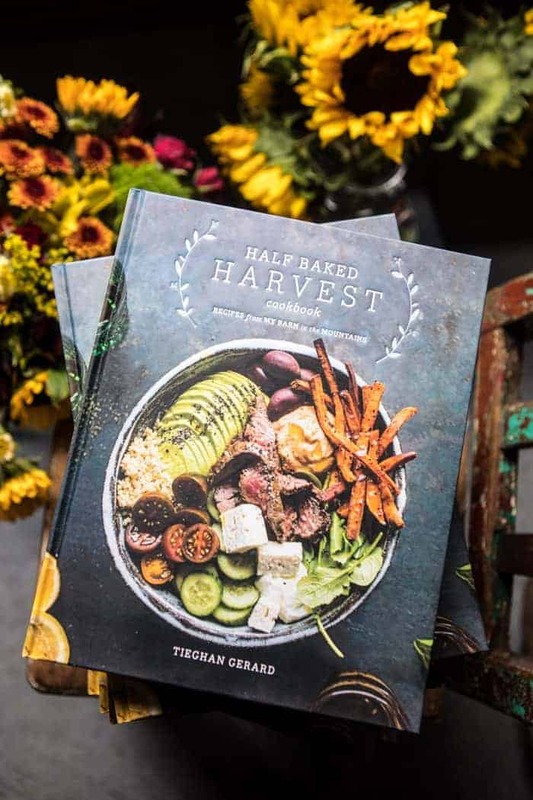 Beautiful, creative and delicious looking! Thank you they were really fun! So cute! I love how they turned out and the pic of the little one digging in! Pinned and sharing on Facebook today! Sooo cute Tieghan! I seriously want to feature everything you link up :o) Just wanted to let you know this project is being featured in my Christmas round-up post. Thanks for linking to Tasteful Tuesdays at Nap-Time Creations. See you next year :o) This feature link will be live Friday morning US time. Wow! That is nice of you to say and do! I am so happy you like my recipes! Merry Christmas! These are super cute! You are a featured favorite this week on Saturday Show & Tell on Cheerios and Lattes! Thanks for sharing last week; we can’t wait to see what you’ve been up to this week! Thanks so much for featuring them! Merry Christmas! Thanks for sharing your beautiful creation. I think I found my recipe idea to celebrate Christmas in July. Love the picture with the little girl. So gorgeous ! 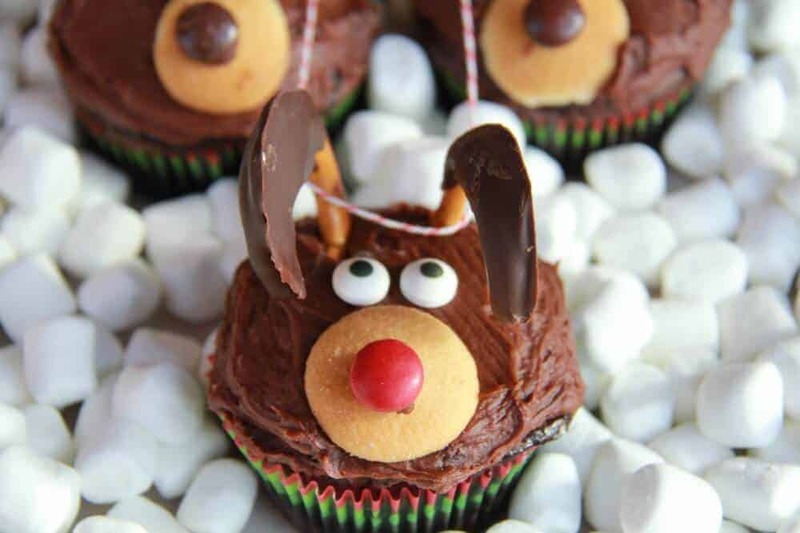 Hi there, we love this Christmassy recipe! Would you mind if we posted it on the official Cadbury UK social media pages? We’re thinking Google+ (where you’d already posted it) and perhaps the Cadbury UK facebook page. 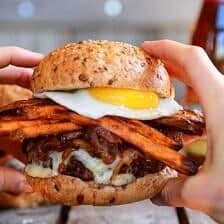 We promise to give you credit and what we’d probably do would be post one of the main pics, a little bit of description and then link through to the full recipe on this page… If that’s ok with you? I hope they love these Theresa! Thank you!